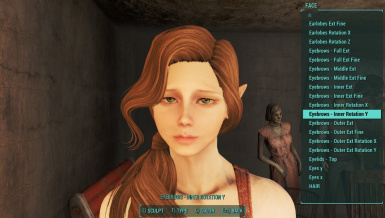 Provides extended versions of the vanilla looksmenu/plastic surgery sculpts, as well as many new ones to enable extended character customizability. Ciri (The Witcher 3) LooksMenu Preset Extra required face morphs (don't forget this one). Constance Preset Pack - LooksMenu Required. Do not skip. Face Replacer - Piper Wright Very modest sculpting was done with this. Will still look similar to screenshots without it, but not 100%. Recommended. Kristin - Face preset MANDATORY if not used, the preset will look ugly as f ! 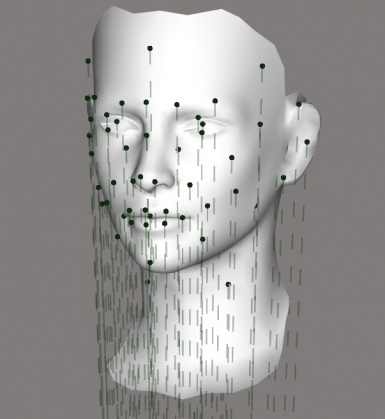 Lara Croft 2013 LooksMenu Face Preset Final Revision MUST HAVE THIS Or it won't look right!! The contents of a decent portion of these files are technically Bethesda property, as including the vanilla sculpt data is required for this to work; you might not want to try selling them unless you like Bethesda possibly breathing down your neck. Aside from that, go nuts, just please credit me for the additional contents. Change to ID index to make room for future expansion. Incompatible with saves and presets made with 0.2. Version step to inform people that the previous version is "fixed". No new features. TL;DR adds new facial sculpts, as well as extended versions of the existing sculpts, to the LooksMenu/Plastic Surgery menu. Customize your face shape beyond the tiny amount allowed normally, and in ways simply not possible before. Existing characters/NPCs aren't touched unless you want them to be. This is entirely an addition, not a replacement. Males and females both benefit, since Bethesda made the both good and bad decision to use similar skeletons for everything. However, due to a bug in the looks menu, having Male installed will cause the Female list to revert to vanilla. This is purely cosmetic - changes to female faces will persist as long as the female sculpt file is present, and extended female presets will load fine - but it does mean you have to remove the Male file to further customize female faces. Important note. Read me or your game will explode. This mod is an incomplete work in (slow) progress. It only covers about 85% of the available bones in the face so far; a full list can be found in Articles. 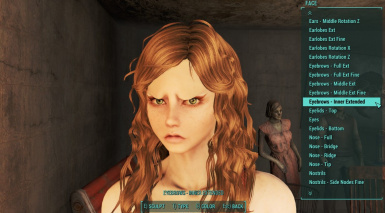 I feel comfortable no longer calling this mod a "beta", but since we're still modifying the face far beyond Bethesda's intended limits, expect facial oddities if you push things too far. If you find a problem (movement for a sculpt is non-conformant/incorrect, sculpt doesn't work, game explodes, etc), please report it in the comments or bug report tab. Despite what's written above, these sculpts should be working properly and should more or less behave as expected in the final product. Comments and suggestions of any other sort are, of course, welcome. For status/progress/ramblings, see the blog I set up for such things. Skip to "How?" if you don't particularly like reading. 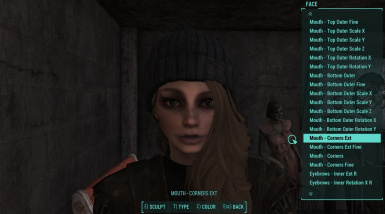 Fallout 4 uses a bunch of bones for most of its facial customization. Anyway unfortunately, whoever was in charge at Bethesda was all "You know what would be a cool take on this otherwise potential-filled system? if we limited the bone movements to a tiny range, and only allowed the player to rotate a few of them. We don't want them looking much different from the other denizens of the Commonwealth, after all." Along comes me. At first I tried increasing the range on the sculpts already in place, but for whatever reason modifying the range on existing sculpts will affect face data that's already in place. The end result was, anyone ever touched with ShowLooksMenu or plastic surgery immediately got their face trashed in varying amounts. This was incredibly annoying to work with, many head-scratching minutes were spent. The ultimate solution? Don't touch the vanilla sculpts. Instead, I created a new copy of each sculpt and increased the range on them. Further, I created a bunch of new sculpts; several of the ones already in place actually control two or three bones, these can now be placed individually. E.g. the Mouth Corners sculpt actually controls 7(!) bones; the two corner bones, top and bottom outer-lips bones, and the "master" mouth bone --- these can now be moved and rotated in individual pairs. Admittedly I'm rather proud of this, the vanilla mouth shapes are terrible and this allows making them not terrible. Even further, I added appropriate rotation to parts that didn't have it, and added additional sculpts for the other two rotations (separate, because the UI only has one control for rotation per sculpt). Because no data already exists for the reference numbers I used, and the new sliders default to all 0s, existing faces are unchanged. - ~221 additional sculpts, many of them new. See the article in the Articles tab (!) for a full list. - ~37 (x2) single-side sculpts for the mouth and eyebrows in the optional version, for creating unsymmetrical expressions with (optional). - All sculpts in this mod are added to the bottom of the list, because vanilla sculpts are immutable. - Completely new sculpts have a "fine" copy that moves less, for fine adjustments. Use vanilla sliders for fine adjustments otherwise. - Everything is rotatable if it makes sense to be, and on sensible axes (e.g. single-bone sculpts like the throat only have Y rotation because twisting/turning them like clock hands is dumb). - All added sculpts are centered and symmetrical. Because nothing annoys me more than sitting and trying to center something by look, only to find it's crooked later in different lighting. - If there's any demand, I can add additional sculpts for creating crooked facial parts and such. - And finally: fully, yes 100%, compatible with all other facial customizers. As far as I know, nothing out there modifies either of the files included. This even includes modified facial parts, so long as they're properly skinned: if you want to use for example M-Face or Oni Cute face parts, drop those bad boys in and go nuts. I've personally been testing everything using the latter. In fact, I'd even go so far as to say that this mod will enhance modded facial parts. If you don't like the shape of the Oni Cute eyes, for example, you can lengthen or make them taller, to an extent. The cover screenshot shows this in action. Keep in mind that the facial bones were intended to be moved in a very small range. Due to this, going too crazy may break or cause clipping in facial expressions and mouth movements, cause clipping with head accessories, or destroy the world. Well, maybe not that last one, but you get the idea. We're working outside of Bethesda factory limits, expect strangeness. Certain things use morphs instead of bones, a prime example being the eyelids. These can be moved, surprisingly, but because the morphs are designed specifically to fit the shape of the eye, it's...not recommended. That said the control is there, go for it. 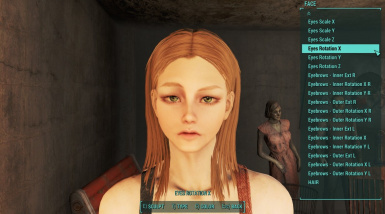 Make a backup preset of your current face before installing, and don't overwrite your pre-install savegame. Just in case. Install LooksMenu, or you'll be limited to using the mouse to select facial parts (which didn't work correctly in vanilla, let alone with over 200 more sculpts in place). Download the package in NMM. Install. Pick a gender. Female will work by itself, but Male will cause the extra options to vanish from the Female list (changes to female faces will persist, however). Highly recommended to only install one or the other, because I don't know what other bugs this bizarre interaction might cause. Enjoy. Yes, this is a required step. Download the NMM package, extract it somewhere if you like. Two folders are contained within: "normal" and "sside". "Normal" includes all the extended sculpts, while "sside" contains the extended sculpts plus single-side sculpts for eyebrows and mouth parts. Once you've chosen which one you want, open the folder and choose the gender you're installing for. Female will work by itself, but Male will cause the extra options to vanish from the Female list (changes to female faces will persist, however). Highly recommended to only install one or the other, because I don't know what other bugs this bizarre interaction might cause. Note that touching facial sculpt settings/information for anything using the HumanRace in the Creation Kit will overwrite the modded files. So don't do that, or at least make sure you reinstall the mod afterwards. Uninstall the mod in NMM. No preparation needed unless you plan on reinstalling later, in which case you'll want to save a preset first, just in case. Note that you will lose the extended customizations that you have made to saved faces, but it shouldn't actually break anything. 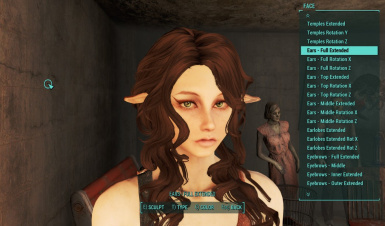 Saving after loading a game without the mod installed might or might not clear the customizations from saved face data; this is why saving a preset is recommended before uninstalling. ...and that's all. Hey, I made a mod without using anyone else's assets for once, go me.